Udaka Tatsushige’s TEDxKyotoUniversity talk on Noh is finally available with English subtitles! Enjoy and let us know what you think! Noh, a classical Japanese musical drama, is not just what you see with your eyes, but what see with your mind too! This talk/performance will show you that in interpreting Noh, imagination is your limit! Tatsushige Udaka was born in Kyoto, and started his career in Kokata acting from the young age of three years old. He was trained by the 26th head of the Kongo School, Hinasori KONGO, as well as by his father, Michishige UDAKA. Performing since he was young, he has had extensive stage and teaching experience in Noh Threatre. He has travelled, performed, taught, and demonstrated Noh in Japan, South Korea, France, and the United States throughout the last decade. Currently, he is based in Kyoto. Towards a Community of ‘Amateur Creativity’ Research? Here is a great review of the symposium ‘Amateur Creativity: Inter-disciplinary Perspectives’ – delighted to read that my paper on Amateurs in Noh Theatre was so well received! Within days of beginning the Get Creative Research Project we came across the AHRC funded initiative, ‘Amateur Dramatics: Crafting Communities in Time and Space’, and were excited to find that a symposium coming out of the project would be taking place at the University of Warwick in mid-September. The Amateur Dramatics project – of which Helen Nicholson is the Principle Investigator – is a collaboration between Royal Holloway and the Universities of Exeter and Warwick, where co-Investigators Jane Milling and Nadine Holdsworth are based respectively. The project also involves two PhD projects, undertaken by Cara Gray and Sarah Penny. Posted on 23/09/2015 23/09/2015 Categories ResearchTags amateur, conferenceLeave a comment on Towards a Community of ‘Amateur Creativity’ Research? Back from the IFTR 2013 conference at the Institut del Teatre in Barcelona. Spanish organisers Boris Daussà-Pastor and Mercè Saumell did a terrific job coordinating what has been the biggest IFTR ever, with more than 800 participants (! ), distinguished keynote speakers and thought-inspiring presentations. Japanese theatre was present in various working groups, not only in the Asian Theatre working group, coordinated by Mōri Mitsuya and Nagata Yasushi, but also in Dance, Theatre and Religion, Theatre Historiography, and others. I particularly appreciated Tsutsumi Harue (Seijo University) on ‘The Production of Hyōryū kitan Seiyō kabuki (The Wanderer’s Strange Story: a Western Kabuki) (1879) and the Journey of Iwakura Embassy (1871-1873) and Hiranoi Chieko (Hosei University) on the ‘History of Local Amateur Kabuki, Ji-shibai, the latter being particularly pertinent to my current work on Noh amateurs. Noh theatre, as expected, only had one representative – myself. My presentation was on the ethical dilemma of a Noh scholar-practitioner who is divided between the loyalty to a teacher and the ethos it represents, and the need for freedom to formulate and express criticism. The lack of Noh at IFTR cannot but point to the need of a more international (intercultural?) and interdisciplinary approach to Noh in the wider context of theatre and performance studies. We ‘new generation of Noh scholars’ should join forces and open up the knowledge of Noh qua performance, not only as study material for translators and historians. I am happy to announce that I was selected as a winner of the IFTR International Federation for Theatre Research New Scholars’ Prize 2012-2013 for my essay “Ezra Pound and the Politics of Noh Films”, which I hope to publish soon. I will receive the prize on the occasion of the IFTR annual conference in Barcelona 21-26 July 2013, which I look forward to attend. This is one of those situations where an academic who also blogs about academic topics would like to reveal more about his work but cannot because he has to wait for the actual paper to be out there lest his stuff is illegitimately taken by some ill-intentioned guy (it happens all the time). See Travis Seifman’s thoughts on academic posting online. Anyway I am very excited about receiving the prize, and I can’t wait to publish the article! See you guys in Barcelona! This year I will be speaking at the International Federation for Theatre Research (IFTR) conference in Osaka 7-12 August 2011. IFTR is one of the biggest international theatre conferences and I am looking forward to participate for the first time, and to do it in Japan. I am particularly excited about the discussions that will develop from the encounter of Western scholars belonging to Anglo-Saxon academia and Japanese scholars, which I think are worlds apart when it comes to background and methodology. This year’s theme is ‘Tradition, Innovation, Community’ and I will be talking within a panel with Prof. David Wiles, theatre historian, my supervisor at Royal Holloway University of London, and Janne Risum from Aarhus University, Copenhagen. Our panel will focus on the inter-relation of aesthetics and ethics in intercultural context and my paper will specifically look at ethics and politics in Ezra Pound’s reception of Noh theatre. I have done quite a lot of work on Pound and for my PhD and I am really looking forward to present it to the IFTR audience. Hope to see you guys soon in Osaka! I am back from the Symposium Japanese Theatre Transcultural: German and Italian Perspectives held in Trier University in collaboration with Università Cà Foscari, Venice 27-29 November 2009. Thanks to a wonderful organisation and to the good-will of a good number of students from the Japanologie department (from Germany, Belgium, Japan, etc) the conference was a success and all participants were satisfied with the fruitful discussions on the theme of the encounter of Japanese theatre with Italy and Germany. Organisers Andreas Regelsberg and Stanca Scholz-Cionca did a great job, indeed. Germany boasts a huge tradition both in Japanese studies and in theatre studies: it is very much interesting to attend conferences outside the anglo-saxon environment and notice so many differences in style and scholarly approach. Any international student working in the UK knows well how British research tends to be critical-theory oriented, sometimes to the extreme: PhD students are now sorted by ‘who they use’ (be it Lacan, Merleau-Ponty, Bourdieu, etc.) rather then what they write about. It is almost impossible to write a paper without at least one or two references to post-modern philosophers, whose theories are often inappropriately borrowed and abused. Theory for theory’s sake. 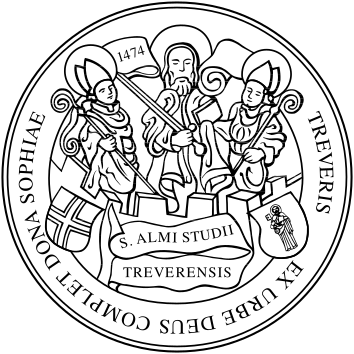 For people like me, coming from a different academic background, it is hard to cope with what over here sometimes seems as the only possible way of academic enquiry. I have heard similar comments from students from France, Hong Kong, Greece, Germany, Japan, etc. It goes without saying that critical theories offer transversal perspectives necessary for the development of a thesis. However, the oversimplification and labelling of modern philosopher has created a division between ‘primary sources’ on one hand, and ‘academic tools’ on the other. Not to mention the fact that ‘acceptable’ critical perspectives only come from recent and mostly, of course, Western philosophy. The most interesting aspect of the symposium was the combination of papers by scholars and practitioners – if this is rather common in UK and USA, in Germany and Italy it is still rare. This has been a successful attempt at an attempt at bridging the fictional gap between ‘theory’ and ‘practice’ as well as between ‘Japan’ and ‘the West. There is so much to learn from the language of the practitioner, so different from that of the onlooker. Practice is all that theatre is about, after all. We are all looking forward for this to happen again. 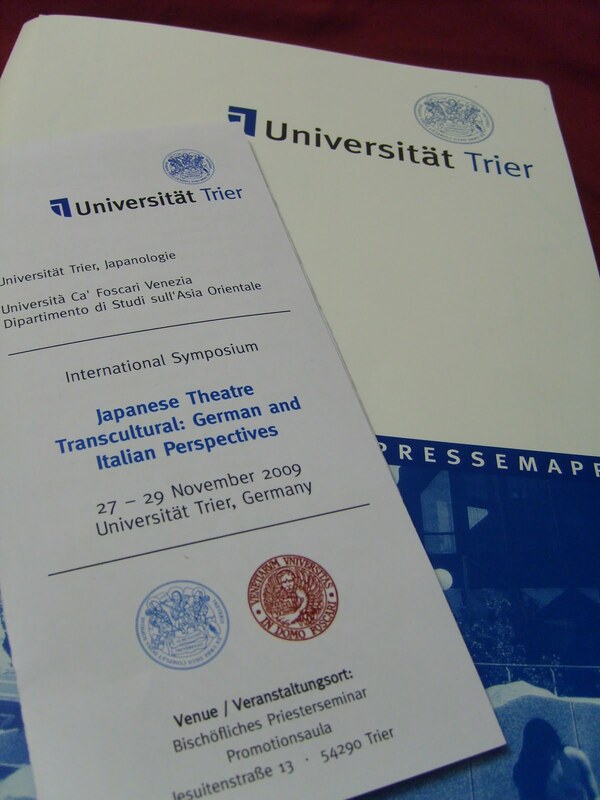 Next week I will talk at the International Symposium Japanese Theatre Transcultural: German and Italian Perspectives 27 – 29 November 2009. Universität Trier, Germany. Here is the abstract of my paper, entitled ‘The International Noh Institute of Milan: Transmission of Ethics and Ethics of Transmission in the transnational Context’. The paper explores the intersection of aesthetics and ethics in Noh practice. Noel Pinnington (2006) has discussed the primacy of the concept of michi as ‘path through life’ in the writings of Zeami and Konparu Zenchiku, where spiritual and ethical virtues are a necessary condition for aesthetic achievement. Today Noh is taught in various contexts outside Japan, reflecting different agendas of teachers and trainees. How are the ethical aspects of Noh considered in contemporary non-Japanese teaching environments? What are the implications of introducing the ethics embedded in Noh practice outside its original context? Taking on Levinas’s ‘ethics of responsibility’, the paper will use theories of ‘legitimate peripheral participation’ (Lave & Wenger 1992) to explore the community of learners and the teaching methodology of the International Noh Institute.